This post will keep you in good stead for converting audio to mp3, no matter your source audios are general recordings, songs or Apple DRM-ed music/audiobook downloads. The business model of personal and home entertainment is changing over time. Setting music for example, it has already experienced two turning points in the last few decades, from physical cassettes to CD discs to the recent online streaming services. We don't know what's going to happen in the future, but going through these industry changes does bring us much pleasure. There are many musicphiles and audiophiles who are interested in collecting various audio files, e.g. songs, audio books, podcasts and (WhatsApp) voice messages/memos. If you're one of the crowds and want to convert certain audio file(s) to MP3 for playback on more devices or other purposes, you can use the easy and safe audio converters listed below. VLC is an audio player and converter. With it, you can transfer quite a lot of audio sources into MP3 including VCD, SVCD, Audio CD, WMA, OGG, WAV (including DTS), Raw Audio: DTS, AAC, AC3/A52, Raw DV, FLAC, Standard MIDI, and Creative™ Voice. It is a well-received player program with no spyware, ads or any user tracking behavior. Before you start the audio conversion, you are allowed to edit video bit rate, channels, and sample rate manually. However, it doesn't support batch converting audio files to MP3, nor the copy protected audios like the iTunes purchases. Begin by adding a local audio file by clicking Media -> Convert / Save -> Add. 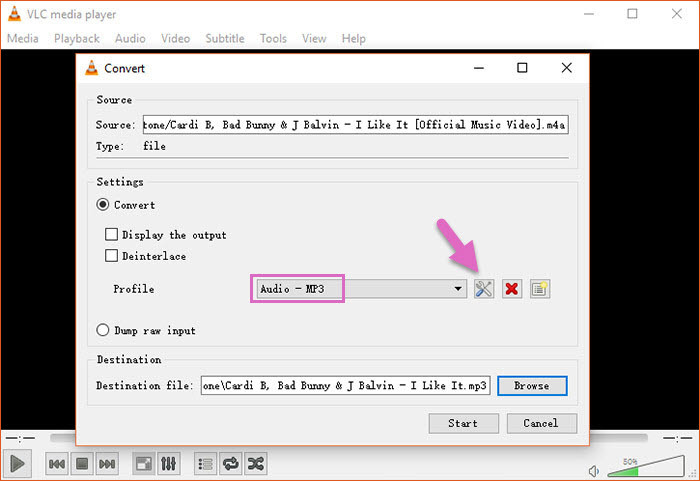 Tap "Convert / Save" to set "Audio - MP3" as output profile and edit the audio codec if necessary. Note it's the CBR/constant bit rate mode that VLC uses to convert audio. There are some other players who are able to change audio format from general ones to MP3, too, for example, Windows Media Player, QuickTime Player and iTunes. Similarly, converting audios in bulk is impossible. When you want to convert an entire music playlist or some DRM-ed files, you have to turn to pro-grade audio converter. Go ahead to get such software suggestion. Saving diversified audio files in MP3 format ensures their compatibility with all devices and players you may listen to them on. Here the VideoProc is capable of converting your large batch of music files into MP3 at GPU hardware accelerated speed, and join any of them together into a single MP3 if you prefer. It embraces audio inputs in: AAC, AC3, DTS, AIF(F), AMR,APE, ASX, DTS, MPA, M2A, M4A, MKA, OGA/OGG, OMA, RA, MOD, MP1, RAM etc. Click +Music to select and load source files to the software. Set MP3 as the target format. By default, the bit rate is defined at 128kbps and the sample rate 44100 Hz. You can tweak their values and customize audio's quality level (low, medium or high) on the panel by double clicking MP3 option or "codec Option" icon. Browse and select a folder as the output folder. RUN the audio to MP3 conversion. When combining source FLAC, WAV, M4A or other audios to one MP3 file, do remember to check "Merge" option right above the output folder. You can also pick some other audio converters out to do the same job like Freemake Audio Converter, Format Factory, online audio converter services and such. For advanced users who want to add effect, transition or do complicated audio mixing, please turn to those waveform-enabled audio editors. Key Features: iTunes purchases to MP3 incl. protected M4B/M4A books and M4A/M4P music. Streaming music service has been a part of our daily lives nowadays. However, the preloaded DRM tech inside your music files restricts their compatibility a lot. How to convert them into DRM-free MP3? Here we give a good bet to decrypt any music or audio files bought from iTunes store and Apple Music, stable and secure with no risk of losing quality, erasing data or revealing private information. Tap Remove DRM to crash encryption and export MP3. The default path for exported items is under C:\Users\Administrator. You can change it to other path under settings. 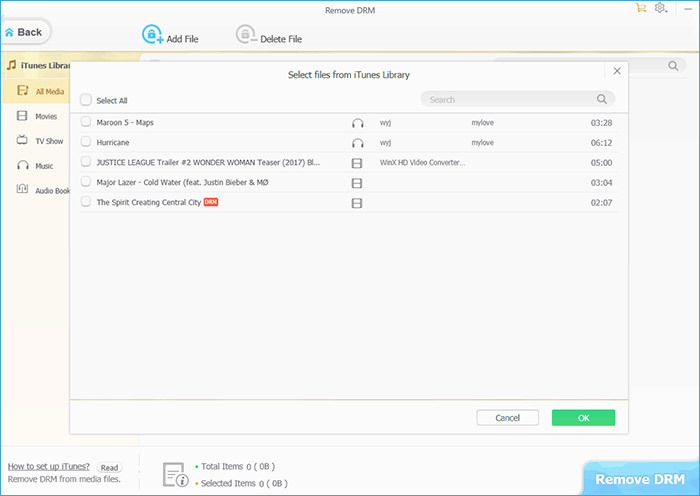 If you are willing to convert encrypted audios on iPhone to MP3, you should connect your mobile to computer and make use of other tools of WinX MediaTrans, e.g. Music Manager, Voice & Ringtone, and Book. This article will show you how to convert MP4 to MP3 with WinX Video Converter for Windows 10, 8.1 or lower. Free get the 2019 best audio converter to convert any audio files to MP3 for playing on various devices. 2019 Free DVD to MP3 Converter for Windows 10, 8.1 etc.